Our scheduled reports feature allows you to send an email with an attached image of your dashboard in png or pdf format. You can send a one-time email, or you can schedule it to send every week (or multiple times a week) at a day / time that you specify. To get started, open the share menu at the top right of your AppInsights dashboard. 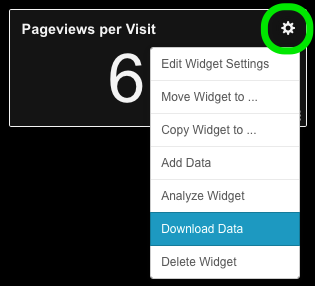 If you’re interested in interacting with your AppInsights widget data using other tools, you can easily export data to a CSV spreadsheet. Please note that the export history will vary depending on the widget in question. A standard number widget might only provide a single data point, while a line graph that has been populated over many months will be represented by a larger data-set within your exported spreadsheet. Please note the specifics of each visualization’s “data memory” can be found in our widget technical specs support doc. For users that are interested in exporting data dynamically using our custom API, please refer to the API documentation for comprehensive instructions.